New Haven, CT: Yale University Press, 1994. When I was 18 I decided to never lock my car for religious reasons. I heard a good sermon about detachment form possessions and, crazily enough, tried to put it into practice. It wasn’t any kind of grand idealistic gesture—its not like I left the keys in the ignition—I didn’t want people to steal it, I just wanted to have some sense that this car, like everything else in life, wasn’t something that belonged to me in the strictest sense. I remember the day, however, that I drove my friend to Best Buy and he had his backpack loaded up with valuables with him. When we got out he asked me if I could lock it. This went against my principles; religious principles, no less. Not wanting to be a jerk or make a big deal out of it, I went ahead and locked the door. This illustrates an important point that Paul Ramsey and other defenders of Christian violent resistance argue: the right thing to do changes when it’s not just me alone in the equation, but also our neighbor. We might be able to stomach turning our own cheek, but are we called to turn our neighbor’s cheek also? My last post was on a book about Christian nonviolence, in the spirit of fairness this book is a defense of violent resistance from a Christian perspective. 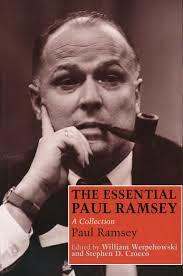 Paul Ramsey was one of the most prominent Christian ethicists in the 20th century. In general he represents the perspective of Christian Realism, which tends to take very seriously the corrupted nature of our world and the humans who live in it. What sets Ramsey apart in this perspective is his tendency to reject a means-end justification of action/policy. Rather, Ramsey often argues for “exceptionless” rules that no consequences can justify. In the first essay, “Christian Vocation and Resistance,” Ramsey wonders how a neighbor-centered ethic of love (as Christianity surely represents) could indeed really do without some provision for violence in defense of a victimized third party. As he would say in a later essay, it’s not about finding exceptions to the commandment “thou shalt not kill,” it’s about responding to the distress of a neighbor from a Christian point of view. Ramsey suggests that Jesus’ injunction to “turn the other cheek” is fine in its own right because it is the simplest of ethical situations—that between oneself and another. The problem is that this teaching doesn’t seem to really take into account or apply to cases where there is a third party. What might Jesus have done had he come upon the traveler in the story of the Good Samaritan, had he arrived at the moment he was being attacked? This essay then recalls the ancient theory of ‘Just War’ as found in St. Ambrose and St. Augustine in order to revise them for the purposes of a defense of Christian physical resistance in the modern world. Augustine supposes that if it’s just a matter of oneself and another, then there is no good reason for violence, but if the question turns to the defense of the defenseless, then there are cases where violence is necessary and justified. Ramsey revises this basic claim to suggest that there are even ways in which self-defense would be justified. He appeals to the complexity of some situations that realistically occur in and out of crises like war that suggest that self-preservation could itself be a result of a neighbor-centered ethic of love. In “Justice in War” and “Making ‘Just War’ Possible,” Ramsey turns his attention from individual circumstances to political entities engaging in war—and ostensibly the support and participation of individuals for such a thing. Perhaps his most unique contention here is the issue concerning causing direct harm to innocents. For Ramsey, the ends do not justify the means. Innocents (non-combatants) are never allowed to be directly attacked no matter how convenient or proficient such an attack might be. This sets him apart from other Christian Realists like Reinhold Niebuhr. We might note, however, the “directly” part of this argument. Ramsey does not suppose that innocents will not be harmed in war, just that any direct and purposeful attack on innocents is irrevocably immoral and blatantly unsupported in Christianity. A remarkable feature of the first essay in particular is Ramsey’s criticisms not only of questionable practices in war—such as the nuclear bombing of Japan—but also the kind of war-mongering attitude that makes posturing at war a basic feature of political relationships. Although in other places Ramsey seems conflicted on this issue, in the first essay Ramsey insists that using the threat of violence to ensure peace is a self-fulfilling prophecy that will eventually result in either having one’s bluff called or having to make good on one’s promises. Either option is politically bad and ethically wrong. One particular turn of phrase that Ramsey uses throughout all the essays is that “Jesus did not teach that his disciples should lift up the face of another oppressed man to be struck again on the other cheek. (71) Its inclusion in all of his essays suggests that this thought in some way cleverly represents his more detailed arguments. It’s hard to deny he has a point here. Jesus’ example doesn’t include a third party, and a true neighbor-centered love seems to include some provision for physical protection if necessary. The other thing that stuck wasn’t a particular argument, but rather the way in which Ramsey maintained that love—agape—is the driving force behind legitimate Christian use of physical force. And he does this in a way that does not feel illegitimate, as if he’s just using love as a banner. Ramsey’s perspective does seem to take love seriously as the chief virtue of Christian ethics. Sometimes this even leads him to criticize the politics of his day, which is commendable. In arguing for justifiable violence and war, Ramsey is not just spewing propaganda for some nationalistic war-machine. He’s sincerely calling upon Christian thought, Scripture, and tradition in order to discern in what ways and by what means Christians ought to take up arms against another human being. I really lean toward the perspective of Christian nonviolence, but I’m not sure I swallow all of that kool-aid. The perspective of nonviolence is extremely helpful at cutting away a lot of uncritical, un-Christian modes of violence in our world. And in a perfect world I don’t think there is a place for violence at all (and I don’t know many who would disagree). But I wonder sometimes that Christian nonviolence makes too arbitrary a distinction between physical violence and violence/power/force broadly construed. Is there a real distinction, for instance, between using physical force to make someone comply and establishing a law for the same purposes? I use all sorts of non-violent force as an essential means of raising and training my kids all the time. Whether Jesus hit people with his whip or not, he’s still implementing a kind of ‘violence’ that makes people do what he wants whether they want to or not. But, more importantly, when the issue involves my family, my neighbor, really any other human being in need—that changes things for me at a personal level beyond the theoretical level. Without the need to engage in needless, excessive violence, there is something to be said about taking the necessary measures, including defensive physical resistance, to protecting one’s neighbor. At the same time, I can’t go all the way with Ramsey either. As I read his arguments I kept feeling like the Kingdom of God was being traded for our desire to save ourselves and our neighbors from any suffering altogether. I found myself gravitating to the ancient argument for Just War—when it is just an individual matter then we are obligated to view our enemy as a neighbor even to the point of death. But if our neighbors are brought into the equation there are places for neighbor-centered violent resistance, though it is largely defensive and aimed at doing the least possible damage. The tendency to want to stretch this line of reasoning, as Ramsey does, to cases of flat-out aggression and self-preservation is the point at which I feel like the Kingdom of God is slipping away. Still, I think everyone can and should benefit from reading a theologian like Paul Ramsey who argues his position carefully and from the perspective of love and compassion, critical of the poor defenses and uses of violence in the world.